That might not be a direct quote but what he means is that when we all come together and share, we’re a happier race, living in a happier place. There is a similar idea preached locally. United Way of the Lower Eastern Shore’s mission plainly states ‘To create and enhance opportunities for making a positive and lasting impact in Education, Financial Stability and Health for all.’ The Harrison Group is behind that mission 100 percent and for the past two years our restaurant division has partnered with them in an effort to give back to the community where we live. Our efforts of raising money was in conjunction with other Ocean City, Maryland restaurants in the form of a friendly competition. The challenge was to come up with a creative way of using food specials and menu items to see who could raise the most money for those that need it the most. Our fundraising campaign was dubbed the ‘HUGE Harrison Group Fundraiser’ and ten of our restaurants / bars were on board. We came up with drink ideas such as the Brilliant Peach Cocktail, the Beach Break Sunrise and, a personal favorite, the WOO WOO. $1 from each drink sold went to the United Way, and ultimately, back into our community. Over the past two summers the Harrison Group Restaurant Division has raised the most overall and donated nearly $40,000 back into our community through the United Way LES. In simple terms $40,000 Provides 5,714 hot and home delivered meals for Meals on Wheels. These are meals delivered to local seniors who are on a fixed budget, have minimal transportation and in a lot of cases, live alone. On October 31st members of the Harrison Group Restaurant Division presented the United Way of the Lower Eastern Shore with a check for $23,500 from the summer of 2017’s program. From left to right is Jeb Vetock of Harrison’s Harbor Watch, Kevin Adams of The Atrium, Mark Mayers - General Manager and Corporate Chef of Harrison Group Restaurant Division, Kacey Decker - Special Projects Manager of the United Way LES, Scott Sudol of 32Palm and Tom Creveling of the Coral Reef Cafe. Restaurants involved but not pictured are the Caribbean Pool Bar, Hemingway’s Restaurant, Mañana Mode, the Original Pool Bar, The Deep End Pool Bar and Rumba’s Lounge. 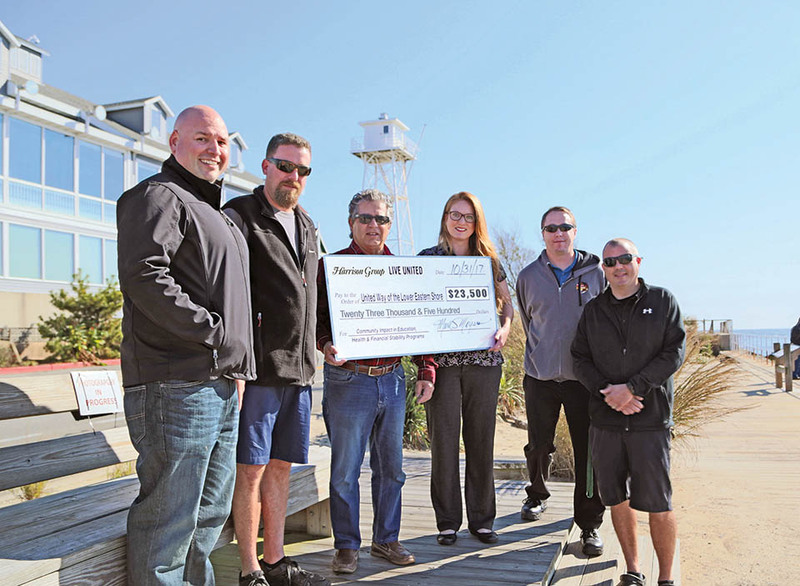 “The Harrison Group Restaurants take great Pride in partnering with United Way of the Lower Eastern Shore in providing worthy support for so many local organizations and families in need. So much of our funds raised are put to work in our own communities. I am very proud of our restaurant teams efforts from the past 2 years in raising nearly $40,000. We look forward to working hard again next year and are proud to continue our partnership efforts with United Way and serving the community we live in.” Says Mark Mayers, General Manager and Corporate Chef of Harrison Group Restaurant Division. Thank you very much to all our patrons who contributed, the hard work of all of our restaurants and most importantly to the United Way LES for the opportunity to give back to those that need it the most. To learn how you can support our town please click HERE.